AEM Limited, a unit of AMETEK Aerospace & Defense, installs a new semi-automated Testek hydraulic test stand at its Ramsgate, Kent, facility in the United Kingdom. 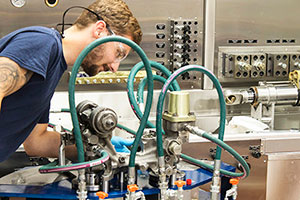 The hydraulic test station provides AEM the capability to test a wide-ranging variety of hydraulic units, including pumps, motors, transfer units, valves, controls, actuators, servo valves, servo actuators and flight controls. It has four independently controlled manifolds and can meet unit requirements up to 5,000 psig and 42 gpm. The pump motor test station is capable of up to 4,000 psig and 50 gpm.